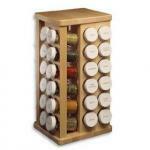 When it comes to choosing a spice rack for your home, there are a lot of factors to keep in mind. Price, variety, and storage location will all play a big part in helping you determine which rack will work best in your kitchen. The biggest question usually is: how many herbs and spices do you really need? That all depends on how often you cook at home and what style of cuisine you cook most often. If you’re adventurous and like to try many kinds of cultural recipes, then you’ll also want to have a wider variety of spices at your disposal. 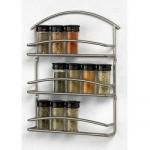 It can be exciting at first glance to come across a spice rack on sale and find that it already comes pre-filled with dozens of herbs and spices — “more bang for your buck,” as the saying goes. However, depending on what the spice jars are filled with, this might be more expensive in the long run. Despite not having an expiration date on the jar, dried herbs and spices can quickly lose their potency once opened. Powdered, ground herbs have a shelf life of at least one year. Whole herbs (like bay leaves) will keep a bit longer, and spices will retain their flavor the longest. To help prevent herbs and spices from losing their potency, make sure the jars are stored away from heat and humidity. Ideally, then, a home cook will use as many fresh herbs as possible and use the storage jars for ground spices, which have a longer shelf life. There are several dried herbs that show up frequently in recipes and are good to have on hand just in case, such as rosemary, parsley, bay leaves, dill, thyme, oregano, sage, and basil. Essential spices for a well-rounded pantry include cinnamon, ginger, cumin, paprika, garlic, chili powder, and crushed red pepper. Spice and herb blends are a great way to keep essential flavors on hand without breaking the bank. No need to buy one jar of every spice you can think of anymore. Here are some blends to consider: Italian herb blends, seasoned salt, pumpkin pie spice or allspice, curry powder, jerk spice, Chinese five spice, and bouquet garni. So, unless you find your favorite pre-filled spice rack on a ridiculously good sale, choose a spice rack that you can fill yourself. Buying spices in bulk from a specialty store gets you access to incredible flavors, and you aren’t pressured to fill up your spice bottle the whole way either — saving your pocketbook as well. Once you have a general idea of how many spices you’d like to store, think about how much room they’ll require, and pick an ideal spot in your kitchen to showcase them. 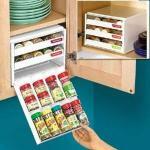 No matter where it is, there’s bound to be a spice rack set-up that will work. There are two kinds of spice racks that you’ll see most often: racks that spin on the countertop, and racks that hang on the wall. Two countertop spice racks that we like are the Olde Thompson Square Rack and the J.K. Adams Maple Wood Rack. Choose the Olde Thompson if you require less storage and prefer to showcase colorful spices housed in modern stainless steel, or pick the larger, 48-jar J.K. Adams if you also want the spice rack to nicely complement your wooden cabinetry. Hanging wall racks have the advantage of giving you extra working space on the counters. A classic option is this satin-finish steel rack by Stacks and Stacks. 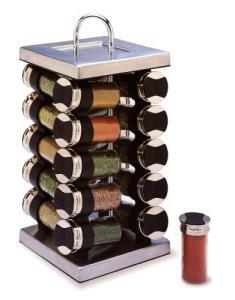 Or, go for versatility with the Kamenstein Magnetic Spice Rack. It can either hang on the wall or be stored in a cupboard or drawer. Stacks and Stacks has been helping people organize their spaces since 1984 and really takes pride in their business. Stacks and Stacks has been in the business of helping people organize their spaces since 1984. 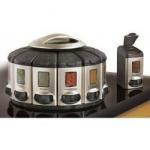 Their product line offers a range of helpful items for the kitchen, office and garden. Their website even offers sections on products for travel, pets and storage for kids.